It’s late summer. Is your home looking a bit tired? Give it a late summer perk up with these 7 easy ideas. It’s getting late in the summer and what was once looking so fresh a month or two ago, is now starting to look a little tired and in need of a little pick-me-up. Fall is on the horizon, but it’s too early to pull out those fall decorations just yet, so what’s a girl to do? If you’re like me, you’re already in the grocery store multiple times each week, so check out the floral department the next time you’re there. It’s a great place to find affordable cut flowers to use to perk your home up with. Try adding some brightly colored ones in a contrasting container to make them really pop! Most hallways are outfitted with flush mount ceiling lights. Our hallway happened to have two can lights that weren’t very effective in brightening the space at all. An easy weekend fix for any dark space in your home is to replace the light fixtures. And while you’re at it, try something a little unexpected. We opted to use pendant lights in our hallway makeover and they never fail to receive ooh’s and ahh’s from visitors. OK – this is probably a no-brainer and is one of the easiest things in the world to accomplish, but it’s certainly worth a mention in the context of perk-up projects. 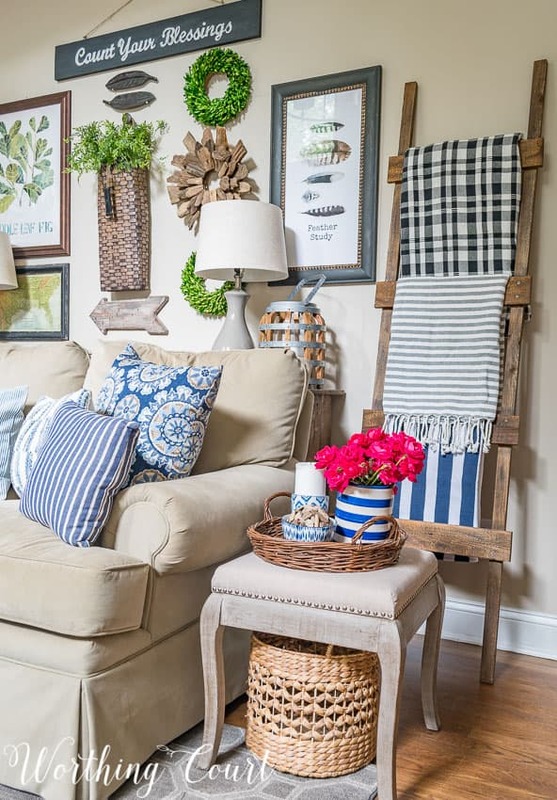 If you’ve never tried it, you’ll be amazed at how simply changing the pillows on your sofa or chairs or changing up the throws you have on display can give a room a fresh look. 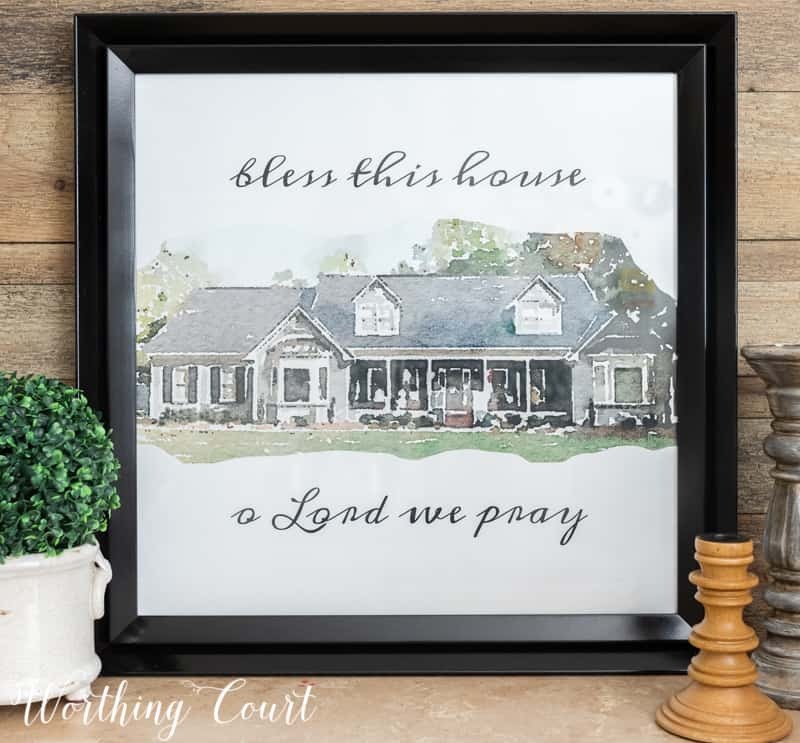 One of my favorite diy projects in our home is the faux watercolor portrait that I created for our foyer. The image and the wording that I added is unique (no one else has one exactly like it!) and is especially meaningful to us. Spend this weekend creating one of your own home – it’s very easy to do! The step-by-step tutorial can be found HERE. 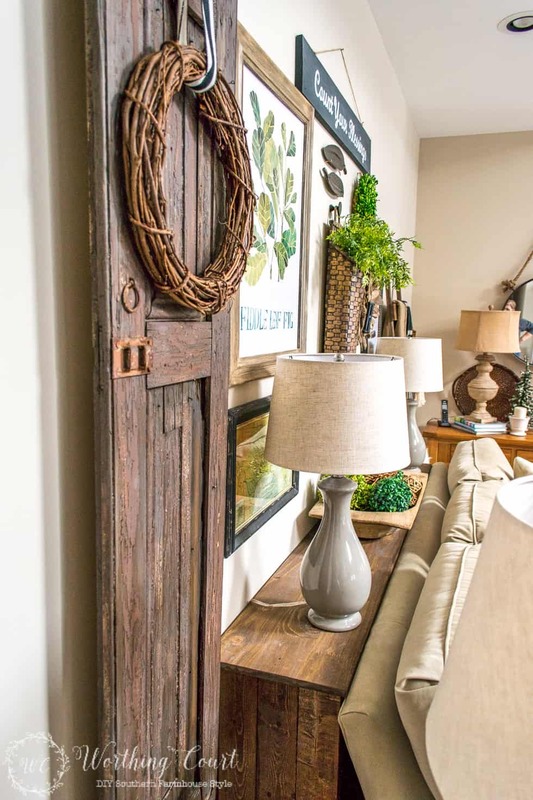 We all have places in our homes where we need just the right piece of furniture, but can’t find exactly the right thing in the stores or online. Am I right??? The solution is to build what you need! I don’t consider myself a furniture builder by any stretch of the imagination, but these two projects are very inexpensive, straight forward and simple to do. I needed to place a console table behind my sofa to move it out from the wall a little bit. Since it wasn’t going to be visible, I didn’t want to spend a fortune on a new one, so I built my own! Get the step-by-step tutorial HERE. 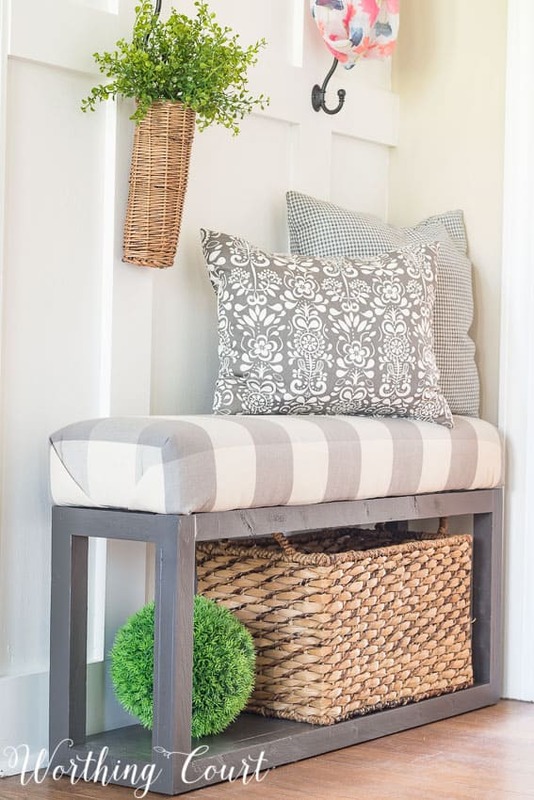 When giving my foyer a makeover, I searched high and low for just the right size upholstered benches to go on either side of the opening into my office. Once again, I built my own since I couldn’t find exactly the size that I needed! Get the tutorial HERE. 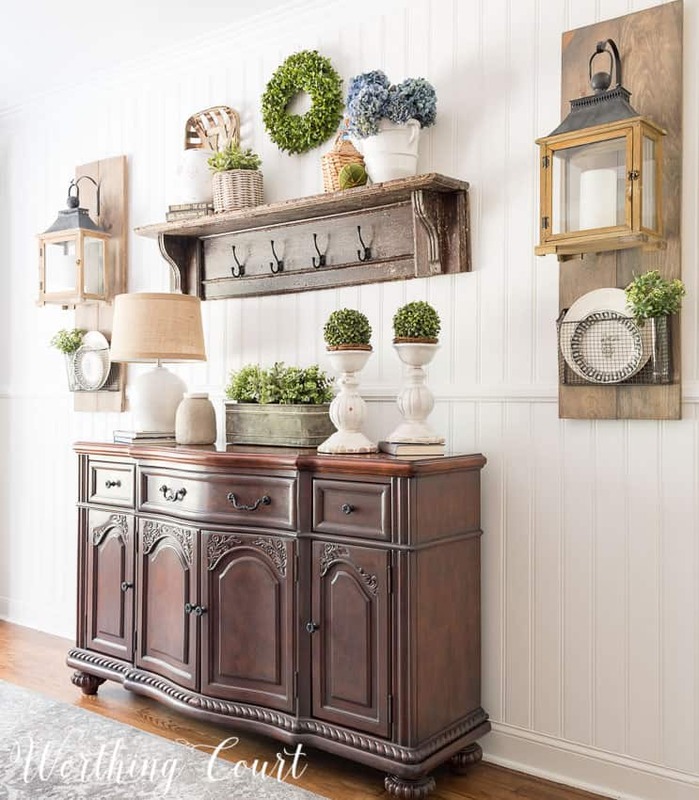 Thank you, Joanna Gaines, for introducing us to the world of shiplap and for making texture on walls popular again! When giving our dining room a makeover, I was on the hunt for ideas that I could use to turn the wall where my buffet lives and my diy hanging lanterns are into a feature wall. 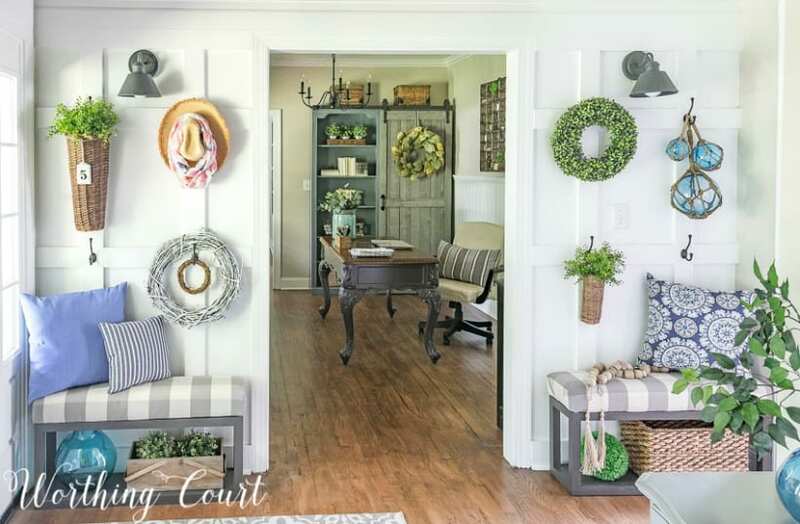 I seriously wanted to do shiplap on that particular wall, but didn’t want to go the trouble of cutting all those boards or go to the expense of purchasing ready-made shiplap wood. While browsing the aisles of Lowes one day, I discovered gorgeous panels of tongue-in-groove-look paneling. After calculating where all of the seams needed to fall and how best to add trim, I’m in love with the result! Tour the entire finished dining room and get a closer look at our feature wall HERE. 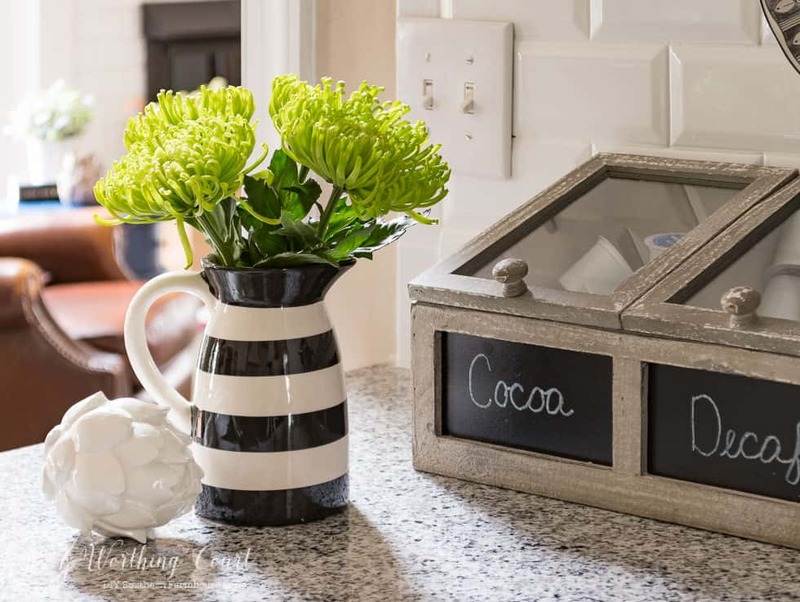 Any one of these ideas will go a long way toward giving your home a little late summer freshen-up and tide you over for just a few more weeks until the seasons change again. Don’t worry – you’ll be able to pull out all those pumpkins and fall leaves before you know it! 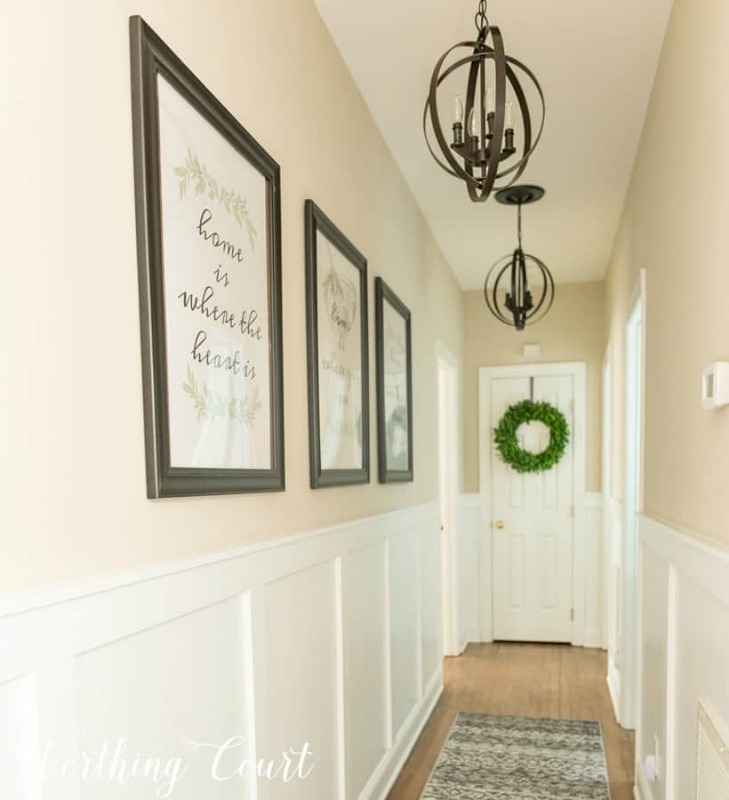 Love your hallway. Perfect editing! Hope your summer has been wonderful. I have been busy too and unfortunately haven’t got to meet you as we had planned to do earlier this year. Furniture market is just around the corner so maybe then? I set out a few Fall things just to get me to my favorite season Fall. Thanks for sharing your fabulous creations,so glad we are on the same page. You are such an inspiration to all of us. Hi Sharon. A girl after my own heart – I’ve been working on fall all week! Let me know what works for you and hopefully we can set up a time to get together! Love your late summer “fresheners” to your home!!! Was especially delighted to see your home-made sofa table as my husband made one for me several years ago. The difference is he put a “shelf” across the middle and another near the floor. The shelves act as the needed support and strength for the table. It looks like a long and low bookcase and gives me a secret hiding place to store all of my throw pillows and covers! Love your blog, Suzy. The hallway is perfect & flawless. And I love the touch of greenery here and there 🙂 Lovely!